FOR PACKING OF POTATO, ONION, GARLIC ETC. Our Leno Bags of Fruits & Vegetables are available in attractive colors to meet the exact requirements of our coveted clients. These are strong and can carry fruits and vegetables in bulk quantity. We also offer customization on our range as per the specifications of our customers. We are counted as a reputed Supplier of Leno Bag, which is ideal for carrying fruits and vegetables in bulk quantity. 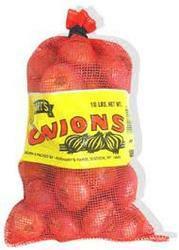 Leno Bag, we supply, finds use in packaging of agricultural products due to its excellent re-usability. We assure that the Leno Bag is procured from the most trusted vendors of the industry. Furthermore, Leno Bag can be acquired at the market leading prices from us.